Nancy Leigh DeMoss: You know women today grab their phones and look up information on all sorts of things? Woman to Siri: Find movie times at theaters near me. Nancy: Well, imagine a woman who has a huge need in her life. She’s desperate and wants to find real answers. So she grabs her phone. Woman to Siri: Find help for marriages in trouble. Nancy: We want women in those situations to find Revive Our Hearts. When they do, they’ll discover practical, foundational, biblical truth they can build their lives on. Developing mobile-friendly sites and the solid content to put on those sites takes time and money. Revive Our Hearts can only do it through the financial support of our listeners. And here in May, we’re asking the Lord to provide at least $450,000 to keep current ministry outreaches going and to develop new ways of reaching women through mobile devices. Would you pray about making a generous gift to Revive Our Hearts at this time and helping us to speak truth to a new generation? Visit our website. Woman to Siri: Go to ReviveOurHearts.com. Nancy: . . . and make your donation. Or you can call us at 1–800–569–5959. Leslie: This is Revive Our Hearts with Nancy Leigh DeMoss for Tuesday, May 12, 2015. Spirituality is hip. Lots of entertainers or celebrities allude to God or the supernatural, but just because the words sound good, are they really speaking the truth? Nancy continues in the series "Discerning Truth in a World of Deception." Nancy: In the last session we talked about the meaning of a Trojan horse, and if you didn’t catch that session, remember the story of the battle of Troy, the Trojan war, and how the Greeks managed to capture the city of Troy in Greek mythology by making this big wooden horse that they pretended was a gift. They left it outside the city and then pretended to sail away, and the Trojans, thinking this was a gift and ignoring warnings to the contrary, brought the horse into the city. They found out during the night while they were celebrating in this big party, thinking they had won the victory, that the horse was filled with Greek soldiers who emerged from the horse and opened the city gates, letting the Greeks in who were hiding outside. The Greeks came in and pillaged the city, killed the men, took the women and children captive, and burned the city to the ground. So the term “Trojan horse” has come to mean something that appears to be a gift but it really isn’t. It’s dangerous. It’s deceptive. It’s not harmless or useful as you might think. Those on the receiving end of a Trojan horse [in the computer world], are usually tricked into opening them. [It’s similar to a virus, but not exactly.] They’re usually tricked into opening them because they appear to be receiving legitimate software or files from a legitimate source. They can cause serious damage by deleting files and destroying information on your system. Trojan horses are also known to create a back door on your computer that gives malicious users access to your system, possibly allowing confidential or personal information to be compromised. Once a Trojan horse is activated on your computer, it can access files, folders, or your entire system. A Trojan horse may actually appear to be a useful application, which is why so many unsuspecting people download them. A Trojan horse might be disguised as a program intended to rid your computer of viruses, yet actually be used to infect your system instead. So you see in the world of computers how dangerous something can be that seems so useful or healthy, and it preys on unsuspecting people, like me, who don’t know better and don’t know how to deal with that. This whole issue of deception was a major concern to the apostles and the leaders, the pastors in the early church, the first century church. They were concerned that believers in Christ, who had come out of this world’s system and out of Judaism, or out of Gentile religions, that those believers would be deceived or compromised or infected by teaching that appeared to be harmless or even useful. This teaching that appeared to be benign, useful, was actually introducing doctrinal and spiritual error that would infect not only the people that heard it, but then they would infect others, and it would spread throughout the body of Christ like a cancer. So the early church was very careful and intentional about doctrinal purity, about making sure these false doctrines and teachings did not get in. We’ll talk later in this series about how you can protect your computer from Trojan horses, in the same way, some parallels there to how you protect your heart and your mind. You’ll find all through the New Testament, in fact, when I stopped to study this, it was far more than I would have thought initially, but frequent warnings to be careful, to be alert, to be on your guard, not to let these things creep in and deceive you, these false teachings. Let me read to you some of those verses. Second John, verses 7–8: “Many deceivers have gone out into the world”—many of them. This is not a rare thing. This is common. Many deceivers have gone out into the world, those who do not confess the coming of Jesus Christ in the flesh. Such a one is the deceiver and the antichrist. Watch yourselves [be on your guard, be careful, look out], so that you may not lose what we have worked for [which is for you to have faith in Christ and a relationship with Him], but may win a full reward. He’s not saying you can lose your salvation, but I think he is saying that there are those in the church who know a lot of doctrine about Christ but who have never really come to know Christ personally, who will be drawn away by these deceptions and will lose what the apostles and the teachers and the pastors have worked for, which is to bring them to faith in Christ. They’re going to be drawn away. So he says, Watch yourself, and make sure you’re in the faith. Make sure there are safeguards, adequate safeguards in your life to protect against these deceivers. I feel a divine jealousy for you, since I betrothed you to one husband, to present you as a pure virgin to Christ. But I am afraid that as the serpent deceived Eve by his cunning, your thoughts will be led astray from a sincere and pure devotion to Christ. We’re going to come back to that verse in this series, but Paul is saying, "There are those who seek to draw you away from Christ, who is the truth. They offer you something more, something else, something that they think that they can convince you you’re lacking. Paul says, "I betrothed you to Christ, to have a wholesome, pure, virgin relationship with Him, and I’m concerned that there are those will come and seduce you, draw you away, even as the serpent deceived Eve and drew her away from the truth. I’m convinced that there are those who will lead you astray from a sincere and pure devotion to Christ." Deception—the number one mark of deception, when it comes to doctrinal issues, is that it draws you away from Christ, or it makes Christ to be something different or someone else than who He truly is. Romans chapter 16, the end of the book of Romans, which is such an incredible doctrinal treatise on justification by faith. You have chapter after chapter of the laying out the great doctrines of our faith in as systematic a way as has ever been done in history, under the inspiration of the Holy Spirit. When he comes to the last chapter of the book of Romans, he greets people who were brothers and sisters in the church at Rome, and he warns them against doctrinal deception. I appeal to you, brothers, to watch out for those who cause divisions and create obstacles contrary to the doctrine that you have been taught. There will be those coming in who will create divisions; they will create schisms; they will create obstacles; they will teach you things that are contrary to what you’ve read in these first fifteen chapters, what you’ve been taught by the doctrine of the apostles. He says, not only watch out for them, but “avoid them.” Don’t give them a hearing. Don’t give them a platform. Don’t read their books. Avoid them. For such persons do not serve our Lord Christ, but their own appetites, and by smooth talk and flattery they deceive the hearts of the naïve (v. 18). Many times in the New Testament, if you read particularly 2 Peter chapter 2 and the book of Jude, you will see that these people infiltrate the church with their teachings. In fact, twice it said in Peter and in Jude, “They feast with you.” They pretend like they’re part of you. They get assimilated into the church. They’re not people who stand up and say, “Jesus is false; Christianity is false.” Now that’s the kind of deception that happens in the world, too, but in the church, they do it much more subtly. With smooth talk, with flattery, they steer you away, they lead you away; they draw you astray from pure devotion to Christ. We see this same context in Acts chapter 20, where Paul is getting ready to leave the church of Ephesus. He’s meeting the elders there at Miletus. He knows he will not see them again, so he’s giving them some last words of warning and caution and counsel. In verse 29, he says, “I know that after my departure fierce wolves will come in among you, not sparing the flock.” I think that’s people from the outside who will come in and try to draw you away. But then verses 30–31: “And from among your own selves will arise men speaking twisted things, to draw away the disciples after them. Therefore be alert.” These deceivers will come even from among your own selves; will say things that seem so right; they feel so good. They will have bestseller books. They will have huge audiences. They will be hugely popular and successful, but they are deceptive. They are deceivers. Be alert. We also read in the New Testament that this kind of deception is not going to diminish. It’s going to increase and intensify in the last days as we get closer to the return of Christ in the end of the age. So we think, Boy, all these years of church history, so glad we got all those doctrinal issues sorted through. We shouldn’t have so much of that today. No. We have more of that today. There’s more deception in the church today. Matthew chapter 24, verse 24 says many false prophets will arise and will lead many astray. “For false christs and false prophets will arise and perform great signs and wonders, so as to lead astray, if possible, even the elect.” These people will do impressive things. But false prophets also arose among the people, just as there will be false teachers among you, who will secretly bring in destructive heresies [they’re subtle; they’re subversive] even denying the Master who bought them, bringing upon themselves swift destruction. And many will follow their sensuality. That’s a clue, by the way, to what they teach. They lead people into things that appeal to their natural, sensual instincts, things that make you feel good. It says, “Many will follow their sensuality, and because of them the way of truth will be blasphemed. And in their greed they will exploit you with false words.” They will be effective. They’ll be impressive; they’ll be subversive, and they will be effective. Their ploys will work, and there are people in your churches, in your communities, people going into Christian bookstores, people listening to Christian radio, watching Christian TV who will be drawn away by these teachings. The essence of the issue here is that these false teachers turn people away from the grace of Christ and the gospel of Christ to what Paul called a different gospel. 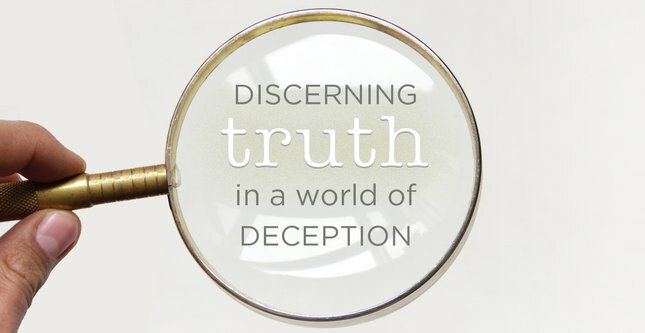 The gospel and the person and work of Christ is at the essence of what is the truth that needs to be protected from deception, and it’s the essence of where these deceivers go to work. Paul says these people are not to be entertained. This is serious stuff. You’ve got to deal with it. You’ve got to take it seriously, so he says, “Be alert.” That’s the takeaway here. Be alert. Be on your guard, and do not think that you or your church or your children or your grandchildren are immune to such dangers. Some of you have friends who have been drawn away into teaching of another gospel—teaching that is not the Christ of Scripture. It has distorted the gospel of Christ. You look at some of these people that you thought were so doctrinally sound, they’ve been in church for years and years and years, and they’ve heard the truth, you were sure they knew better, and yet they have fallen prey to these false teachings, these false doctrines. I got an email recently from a friend, a pastor’s wife. She told me how she and her husband had been involved recently in helping three families get out of a cult church, a so-called church, it’s not a true church, but that had taken them captive with some teaching. What was involved in getting them extricated has been huge, hugely difficult. One of their daughters, as I recall, is still in it, and the families that have gotten out of it have lost everything because of a covenant they signed when they got into it. They were bamboozled. My friend, the pastor’s wife, said to me, “How do people get into these things?” These people were wondering, How were we so blind? How did we get into this? Don’t think that you are immune to the potential of deception. And your children—take seriously the things that influence them, that feed into their hearts and minds so that they will not be deceived. The deceiver works through many different means. I’m convinced that Satan doesn’t care how he deceives you, as long as you don’t believe the truth, as long as you don’t act on the truth, as long as you don’t spread the truth to others. So whatever it takes, he will get you. He’s not going to come as a serpent because none of us would go for that. Serpents today aren’t the beautiful creatures that the serpent was in the Garden of Eden. He was beautiful. He was dazzling. He was attractive, and that’s how the enemy comes—in dazzling, attractive ways. There are many different sources or means through which the enemy brings deception and error, not the least of which is our own sinful flesh, our unrenewed minds—thinking that has not been renewed according to God’s truth—our emotions that have not been renewed. We can be susceptible to deception even if there’s no outside means of bringing deception to us. The traditions of men can cause us to be deceived. There are some churches today, some religions that have traditions that are contrary to the gospel, they’re contrary to Christ, but people have thought this way for decades or generations or millennia, so people fall for that. Another source or means of deception and error is education. There’s nothing wrong with education, as long as it’s education that is based on the fear of the Lord, which is the beginning of wisdom. Secular education today promotes and indoctrinates students in worldly philosophies that are contrary to the Word of God. Friends can be a source of deception, people who talk about their own experience and what they believe and what they think. We’re relationally and emotionally wired, so we think if it happened to her, and she sees it this way, it must be true. I’m not talking about things that seem deceptive. That’s the very nature of deception—it seems to make sense and to be right. Our culture, our secular world system has so many means of bringing deception to our minds and hearts. Entertainment and novels and magazines, these can be very subtle, clever, creative ways of getting us to buy into deception because everybody loves a story. We love to be entertained, and then our defenses are down, and we buy into the philosophy behind that story. I’ll give you some examples of that as we move into the series. It can plant seeds of doubt—after all, they’re professionals. Well let me tell you, the little lady who has a third-grade education but knows Christ and knows the Word of God is wiser than those people with all those degrees because she’s got truth, and they are blind and deceived. Deception can come through popular teachers and preachers and authors, TV and radio ministries, and I’ll give you some illustrations of where I believe that is happening. Sometimes I think they know they are deceiving, and sometimes I think they’re just deceived themselves, and only God knows which is which. But the fact that you heard it on Christian radio or Christian TV or you picked up a book in a Christian bookstore does not mean that it’s truth. There’s a lot of error being promoted through the Christian world, through respected, popular, best-selling authors and teachers. What I do I will continue to do, in order to undermine the claim of those who would like to claim that in their boasted mission they work on the same terms as we do. For such men are false apostles, deceitful workmen, disguising themselves as apostles of Christ. And no wonder, for even Satan disguises himself as an angel of light. So it is no surprise if his servants, also, disguise themselves as servants of righteousness. Their end will correspond to their deeds. Deception doesn’t usually come through this big, huge, ugly monster. Then we wouldn’t buy into it. It’s more often subtle, alluring, attractive, enticing, just little distortions of the truth. But you get off by a matter of degrees, and before long, you’re way, way off. They disguise themselves as angels of light and servants of righteousness. So, again, the challenge the New Testament writers issue to believers in their day and in ours is: Be alert. Watch out. Be on your guard. Don’t think it can’t happen to you. Don’t think it can’t happen to your children or your friends or somebody in your church who’s been under the preaching of the Word for years and years and years. There are deceivers, even deceivers wearing clerical robes or garb or having clerical theological degrees who are out there deceiving the people of God. Maybe they themselves are deceived—I can’t know their hearts—but they are instruments of the evil one. Let me just say that, as false teachers are empowered by Satan the deceiver and they are his instruments, so those who teach the truth to others are God’s instruments, and they are empowered and fueled by the God of truth. Ladies, that’s what we want to be. We want to be women of truth, women who are teaching the truth to our children, to the next generation, who are discipling others in truth. You can be an instrument, a true instrument of righteousness. You can be a true servant of the Lord, but you’ve got to guard your heart, guard your mind, and make sure that you’re not allowing deception to creep in and catch you unaware. Oh, Lord, in this day, how much we need discernment. Your Word says that many deceivers will come, and many people will fall into their deception. I fear, as Paul did for the Corinthians, that many even in our churches today have been drawn away, led astray from the pure simplicity of devotion to Christ, wandering into fields of thinking they’re finding something more or different or better, and they’ve been deceived. So, Lord, we pray that You would rescue them and make us rescuers. Help us to so love and know and proclaim the truth that we are used by You to help protect people from deception and bring them into the light. I pray in Jesus’ name, amen. Leslie: Nancy Leigh DeMoss has been identifying some common avenues of deception—so many of them appear to be safe. We truly do need to learn to evaluate truth and error. I hope you’ll develop this ability by reading the book by Tim Challies called The Discipline of Spiritual Discernment. He’ll give you a biblical understanding of this term and show you what it looks like in your day-to-day life. After reading this book, you’ll be better equipped to evaluate the messages you hear, recognizing falsehood even if it appears in a beautiful package. When you donate any amount to Revive Our Hearts, we’ll send the book by Tim Challies. Ask for The Discipline of Spiritual Discernment when you call 1–800–569–5959, or take advantage of this offer by visiting ReviveOurHearts.com. Is Christianity just one of the valid roads to God? It’s a common claim. We’ll evaluate it tomorrow on Revive Our Hearts.